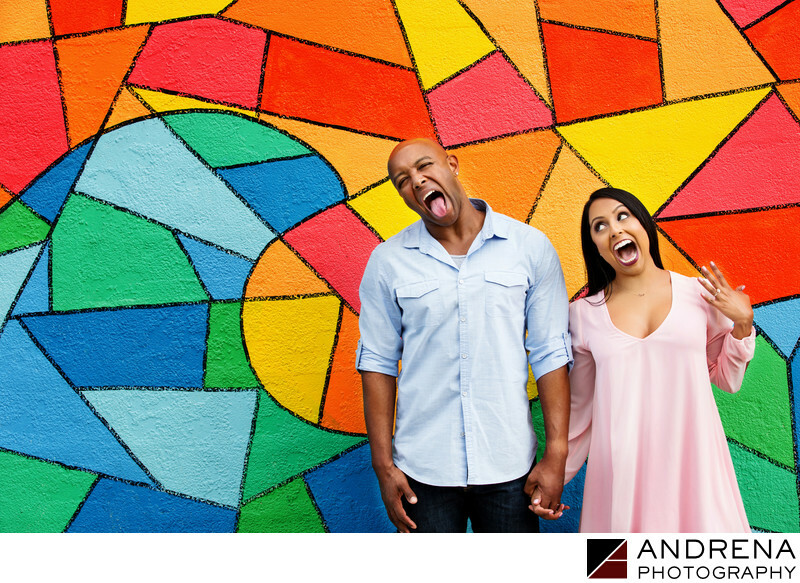 It's not always easy to find colorful locations for an engagement session, but when you hire an experienced photographer who knows the area, you can be sure they'll know where the color is hiding. This couple had a very fun vibe and they didn't really want anything stiff or too formal. I loved their playful nature and loved the story of how they met even more. This wall is usually in bright sun at all times of day, but on this particular occasion, we encountered a lucky series of clouds that shielded us from the sun and provided soft, beautiful light. The end result is a silly photo that we all loved. The use of color in engagement session photos really makes them come alive. I love when I can create a series of engagement photos that look truly different than the colors we will encounter at the wedding location. Many hotels are beige with green plants, which is great. But this is why I always look for colorful locations for my engagement sessions. I love providing a wide range of photos for my clients.